From September 2014, Sky Watch – Civil Air Patrol (SWCAP) will be providing a program of educational engagement. The program will require the school to raise funds for the charity through the year; in return the school will receive a full day visit from a SWCAP representative. The team member will provide a program of presentations and videos on search and rescue (SAR), along with practical exercises in SAR planning, etc. 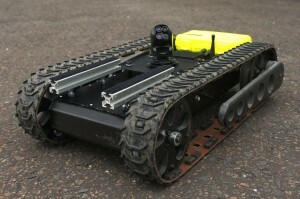 The Rover 500, a tracked vehicle to test students’ communication skills. Sky Watch – Civil Air Patrol is a registered airborne observation charity which has been operating in the UK since 2001. Northern Ireland operations began in 2011. Sky Watch provides free of charge aerial support to the fire service, police and voluntary organisations in humanitarian search and rescue using manned aircraft, UAVs and Aerostat Balloons. Sky Watch searches include looking for missing people, monitoring flooding and wild-land fire incidents, looking for animals in flooding and snow conditions and environmental monitoring. Sky Watch raises money from the community to provide this free service. Funds are also raised by public speaking engagements at local and regional events, including youth groups. If you are interested in learning more about our Schools Program, please contact us.